Last month I reviewed three fragrances from the Maison Martin Margiela Replica fragrance collection: Flower Market, Beach Walk and Funfair Evening. This week I tested two more, Lazy Sunday Morning and Promenade in the Gardens. Lazy Sunday Morning, developed by perfumer Louise Turner, is meant to suggest "silky skin, crumpled linen sheets and the reassuring scent of fresh laundry" in "Florence, 2003." Its notes include aldehydes, pear accord, lily of the valley accord; iris accord, rose absolue [sic], orange flower accord; white musk accord, Indonesian patchouli oil and ambrette seeds absolute. 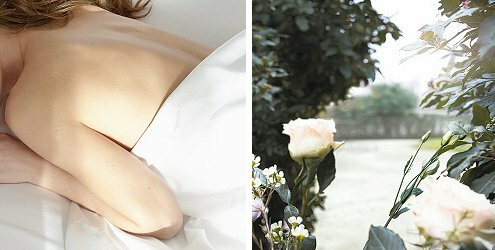 Leaving aside the question of why Florence was chosen as the "location" for this perfume, how does Lazy Sunday Morning function as a "fresh and clean" fragrance? Not very well, I don't think. It begins with some promise: I like its lily of the valley and sheer woods well enough. But then the whole thing is overwhelmed by a gust of aldehydes that sting the back of my throat if I sniff too deeply, and some very generic sheer musk and "white" floral notes. That plasticky musk dry down (wouldn't you know?) just wears on and on, like the whine of a mosquito: thin, piercing, persistent. Lastly, the price of this fragrance is something of an insult. I don't think you or I should have to pay $125 for something that ends up smelling like a combination of bleach and soap, when we could spend much less (about $40, actually) for a Clean fragrance (Shower Fresh, Cool Cotton, etc.) — or, for a different and more pleasing take on musky-clean skin, a discounted bottle of J Lo Glow, also developed by Turner. As you can guess, after my previous experiences with the Replica collection, I didn't hold out much hope that Promenade in the Gardens would interest me. That's where I was wrong. Promenade in the Gardens reportedly evokes "the romanticism of British gardens" in "Oxfordshire, 1986." It was developed by perfumer Carlos Benaïm and its composition includes a "crispy" green accord, freesia accord, coriander oil; Turkish rose oil, peony accord and sambac jasmine absolute; patchouli heart oil, vetiver oil and Australian sandalwood oil. Promenade in the Gardens is a radiant modern rose chypre. It stands beside Lazy Sunday Morning like a woman in a designer dress and heels next to a teen-aged girl in a tank top and flip-flops. It evokes Paris more than Oxford, because it has a "classic French perfume" feeling. It's been streamlined for twenty-first century purposes, of course, and there isn't any natural oakmoss in there, but you still get the sour green of the coriander; a slightly jammy rose; and damp, pungent woods. Promenade doesn't have an animalic base, or all the drama of a vintage chypre, but it's a highly respectable and appealing update to the genre. If you ever thought that you'd like to own a lighter, brighter alternative to Estee Lauder Knowing or Serge Lutens Rose de Nuit, Promenade in the Gardens might be what you were looking for. Of the five Maison Martin Margiela Replica fragrances I've sampled, Promenade in the Gardens is the only one that I enjoyed wearing. I'd even consider buying it, if it were available in a smaller bottle at a lower price (and if I could find a way to remove the label). I'd also be willing to bet that it's not selling as other fragrances in the collection. But wait, you might be asking — what about Jazz Club, the sixth fragrance (so far) in the Replica collection? I want to try it, really I do, but it was sold out at three different Sephora locations in Manhattan and no testers were available. (Beach Walk and Funfair Evening also seemed to be in high demand.) If a new shipment arrives at any of my "usual" Sephoras in the near future, I'll request a sample. If you've already tried it, do feel free to comment! 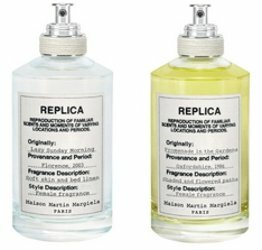 Maison Martin Margiela Replica Lazy Sunday Morning and Promenade in the Gardens are available as 100 ml Eau de Toilette ($125 each). Now, there’s a coincidence. I smelled Promenade in the garden this very morning and was pleasantly surprised by it. If I’d sniffed Promenade in the Garden “blind,” I’d never have guessed it belonged to the same group as the others. It’s much more sophisticated! Thanks for the review! I like (don’t love) them all except for lazy sunday morning. I got samples from Sephora and wore them once since getting them home and totally forgot about them since. What’s the difference between sandalwood oil and just sandalwood, or Turkish rose oil and just Turkish rose? I’ve already totally forgotten about the Flower Market one…! I can’t remember how it smelled… at all. I was puzzled by the use of “oil” and “accord” in the notes listing, too. Most brands don’t bother to use that wording. Maybe they think this sounds fancier, or more expensive? I think it’s meant to imply fancy + real instead of synthetic materials + the extra “exotic” connotations of “far off lands”, but in practice, there’s no reason to think “Turkish rose oil” is any such thing, although of course it might be. But certainly there’s no legal requirement that it be real rose or that it be from Turkey, or that if it’s something expensive, they used more than a drop of it for all 2500 bottles. Obviously I’m extra cynical! I actually thought I was being meaner by leaving those terms *in,* because they look so silly. Very passive-aggressive of me! LOL…it’s a toss up which one of us is meaner then! Promenade in the Garden sounds like the one I would probably gravitate more to because of the peony and moss notes. Seems kind of interesting to me. It *is* interesting — it doesn’t feel like my own fantasy of an English garden, but if you like rose chypres, it’s worth trying at least once. Those Clean fragrances aren’t distributed where I live and I’ve never sought them out because the Turin / Sanchez guide is down on them. Are they any good, or all marketing and no substance? Well… if you want a fragrance that smells like fabric softener, or deodorant, or Windex… they’re fine. Ah, so, i’m guessing I should stick to Pleasures and White Linen then, for that sorta thing? Jessica, you had me at “more Paris” and “designer wear next to flip flops”. These 2 releases actually escaped me. I had to read twice to make sure I read MMM. I enjoy my fair share of chypres so I will definitely be testing this one out should I come across a bottle. One question though, as I always go for EdPs because my skin eats fragrance like mad, about how long does Promenade in the Gardens last? On me — and I’m like you, many things don’t seem to last on me — it “stuck” very well! OOOOH, modern rose chypre. Nice. On the other hand, that is a truly horrid label. I think I’d cover it with a picture of a rose garden or something. And $125, I dunno. At that price, I think I’d just go for a bottle of Lumiere NOire pour femme instead. I still think the labels, and possibly the concept, are late-in-the-day rip-offs of CBIHP. Lumiere Noire Pour Femme is richer and much more animalic, to me — but this one is easier for me to pull off! I totally love Lazy Sunday Morning. On me it’s a rosey floral that just oozes spring. It’s been my go to scent for over 2 months now. Just goes to prove everyone’s tastes are different and it’s a wonderful world we live in that there’s something for everyone! Oh, I wish it were a rosey floral to my nose! I’m glad you found your perfect spring scent, though. Promenade is too similar to Gucci by Gucci. Too much. Really? Interesting! I’ll need to “revisit” Gucci by Gucci. I like Guilty, and I respect Rush, but I haven’t tried most of the others in a long time.